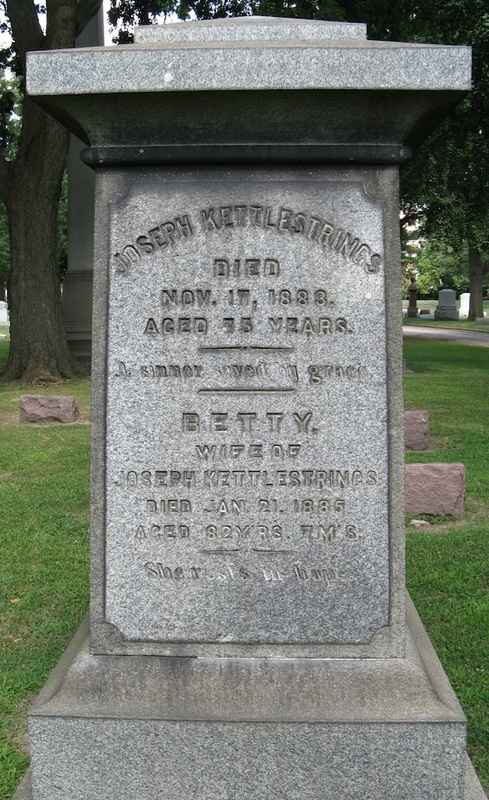 Joseph Kettlestrings (1808-1883) and Betty Willis Kettlestrings (1802-1885), pioneer settlers, community builders. Both born in Yorkshire, England and died in Oak Park, Illinois. Joseph and Betty Kettlestrings were the earliest white settlers in the area now known as Oak Park. 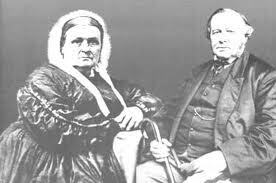 Both natives of Yorkshire, England, they brought their two children to the United States in 1831 and had a third child in 1832 during a brief stay in Cincinnati. They lived in Ohio for less than a year before pushing on through the mud of Chicago to the high ground just east of the DesPlaines River. Joseph worked for friends from England who operated a sawmill on the river. In 1837, Joseph purchased 172.78 acres from the federal government for $215.98 or $1.25 an acre. Today this land is bounded by Chicago Avenue and the Metra railroad tracks, between Harlem and Oak Park Avenues. The Kettlestrings continued to buy land in the area, but unlike many land speculators of the time, the family stayed and built a community. They built their first cabin in 1835 just east of Harlem Avenue and south of Lake Street; it soon turned into an inn frequented by the many travelers who followed Lake Street between Elgin and Chicago. The Kettlestrings moved their growing family, which eventually included eleven children, to Chicago in 1843 for the schools and culture; Joseph worked grading the new city's streets. Returning to their Oak Park farm in 1855, the Kettlestrings began to subdivide their land. Their insistence on temperance and their generous support of local churches and schools were also espoused by those to whom they sold land: the Gales, the Scovilles, and the Austins. Their children married into other early settler families, including the Herricks, the Whaples and the Dunlops. The Kettlestrings' second home, "The Grove," located near today’s Oak Park Public Library, lent Oak Park its first unofficial name, "Kettlestrings' Grove."